'Where do you see yourself in five years time?' His slim reading glasses perched at the tip of his nose, recording every word I said with an emphatic scrawl of his pencil. I thought about it long, and hard. It is always the simplest questions that seem to have the hardest answers. 'I see myself doing something that I love, something which I enjoy, something for which I am excited to wake up for everyday. But most importantly, something where I'm learning new things everyday.' Yes, that was my answer. His face was expressionless, not a hint of emotion. Giving nothing away. My answer still stands today. Although I no longer work as an optometrist, I make sure whatever I do excites me, ignites a passion in me, satisfies me. Something which I look forward to, that gives me a sense of achievement. Something that I love and enjoy. And that is exactly what photography does for me. I love creating images, artwork. Arranging plates and food to make the photograph look as aesthetically pleasing as possible. Carefully choosing props to enhance the food. Deciding on a color scheme, what angle to shoot the food from. Where to place the herbs. From the day I picked up my point and shoot till now, that same fires burns within me. That same enthusiasm. That same feeling of trying a new adventure. And that is exactly what I did this last week. I decided to try something completely- shooting meat. And to complicate matters a little more, shooting it in a style I'm not familiar with. I decided to try out high contrast 'dark' photography- completely out of style and character for me. It was a a fun journey though. Picking dark props, painting moody backdrops, using black reflectors and making friends with shadows. So where are the somber images you ask? Well, they just weren't good enough to publish. As I said, it's a work in progress, a learning curve. But with a recipe that involves, enthusiasm, hard work and perseverance, I'm sure it won't be long before you see them on the blog. Even if the photos were not up to par, the lamb cutlets certainly were. Juicy, spicy, lots of garlic and that grilled smoky flavor. And that is one of the reasons why I love my Le Creuset skillet grill. 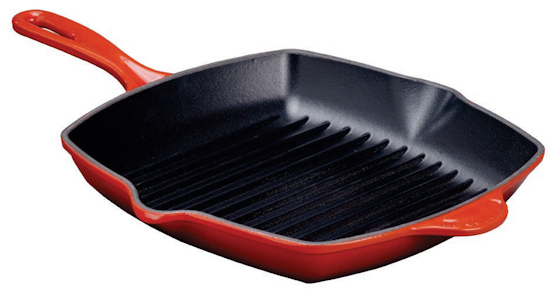 So much so, that I'm happy to give away one Signature Square Skillet Grill ($165) in a color of your choice. To enter, leave a comment here telling me what is your favorite food to grill. The required entry must be done otherwise any extra entries will not count. If you already follow me on Twitter and Facebook and/or already subscribe to Sips and Spoonfuls let me know as well, since this counts as an entry. Giveaway starts on 24/05/2012 and will run until 04/06/2012 at 11:59 pm PST. One winner will be selected at random to receive a Signature Square Sillet Grill ($165). Above competition rules, regulations and guidelines from Gourmande in the Kitchen. Marinate the lamb chops in all the ingredients. You can do this overnight or at least an hour before. Heat about a tablespoon of olive oil in your skillet grill over heat. 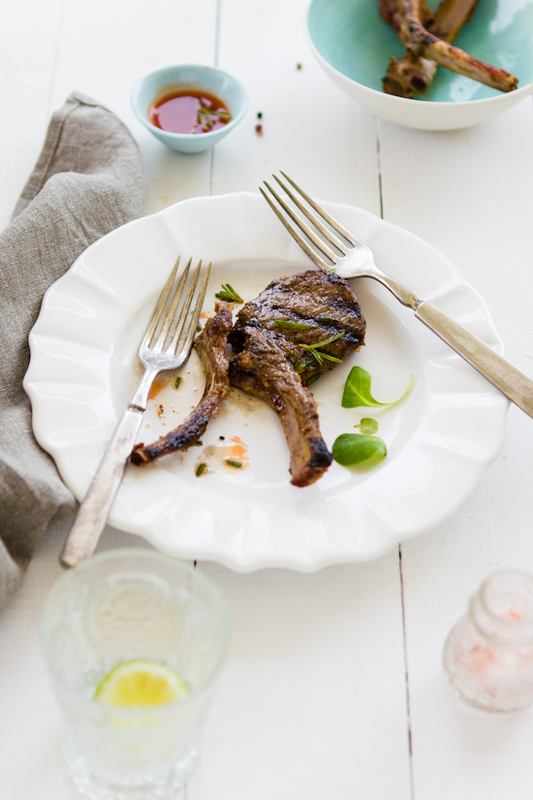 Place your lamb chops in batches on the grill for 2-3 minutes on the first side. Turn over and cook for a further minute or so (cooking time will depend on how well done you like your meat). Remove from the grill pan and let it rest for 5 minutes before serving. I love grilling steak, of course! Nother mouthwatering recipe from uuuu..Picture perfect and tempting. I love grilling Portabello Mushrooms & red peppers with a little balsamic vinegar. So good! LOve love love to grill fish! So yumm...and then pour coconut sauce on top... So yum! Such a beautiful recipe... Perfect for summer. I know my husband would love it! Love grilling pork chops and chicken! I enjoy Brussels sprouts with a last minute toss in pesto post grilling. I already follow your updates on FB and Flickr. Tweeted & twittered your contest with atmyapple. My favorite food to grill is definitely veggies! I love making grilled veggie wraps! I grilled a pork tenderloin last night and it was amazing! I love grilling tri-tip. delicious! I agree with you 100%. Nothing matter more than the joy of doing what you love doing the most! Photography is such a passionate hobby or job for some and I always love trying out new mood. Looking forward to see what you are working on. I love to grill tri-tip Santa Maria style! Another beautiful post! And I agree completely, nothing is more important than following your dreams and doing something you enjoy. You have an amazing gift for photography and that and your obvious love of what you do comes through in every photo. Following Sips and Spoonfuls on Twitter! eggplant! i know that's lame but i love grilled eggplant! That last picture seems like out of a magazine Sukaina.. superb! Beautiful photos1 I love to grill king prawns marinated in a peri-peri sauce. As strange as this may seem, I like grilling lettuce! Hi Sulaina, that's a beautiful answer to the question and one that so many of us miss but would love to find. To be honest, I like the bright photos but since you mention it, good luck with your moody experiments. 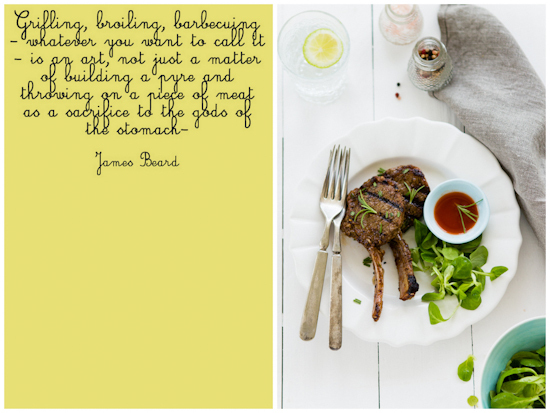 I was wondering if you could tell me what fonts you'd used in your photos, I like the handwritten ones, the garlic and rosemary and the last Grilled lamb colored in letters. Thank you! Nothing better than grilled corn on the cob! I love grilling chicken! What beautiful pictures and loved your answer! 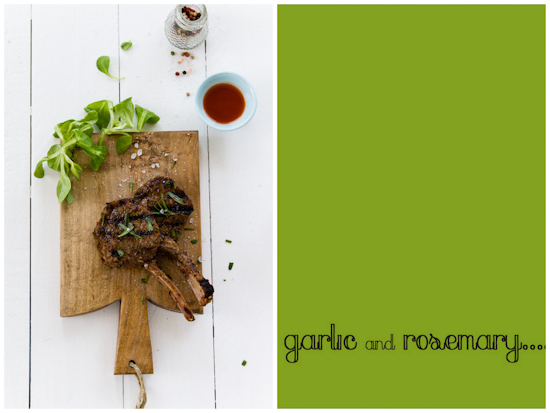 This is a wonderful lamb recipe! we love grilling steak! Thanks for the chance to win! I LOVE grilling vegetables on the grill, like zucchini! It's something the whole family enjoys, especially my mother who is a vegetarian! I like grilling fresh vegetables and salmon. I love to grill burgers. I also love to gril chicken thighs. I Liked Sips & Spoonfuls on FB. Awesome! I love grilling mini-pizzas; I've actually been looking for something just like this now that summer is coming! Thanks! I have a similar marinade for grilled lamb chops. Very nice. Congratulations on making the foodbuzz Top 9! What would I use a grill pan for? Beef, of course! I love this simple recipe. Been wanting to grill lamb chops for long now especially when summer is here. That quote is lovely! My favorite thing to grill is chicken! I am a happy subscriber of Sips & Spoonfuls. Tweeted! I have a US residence - does that count? I love a good old burger! Perfect recipe for the BBQ months to come. 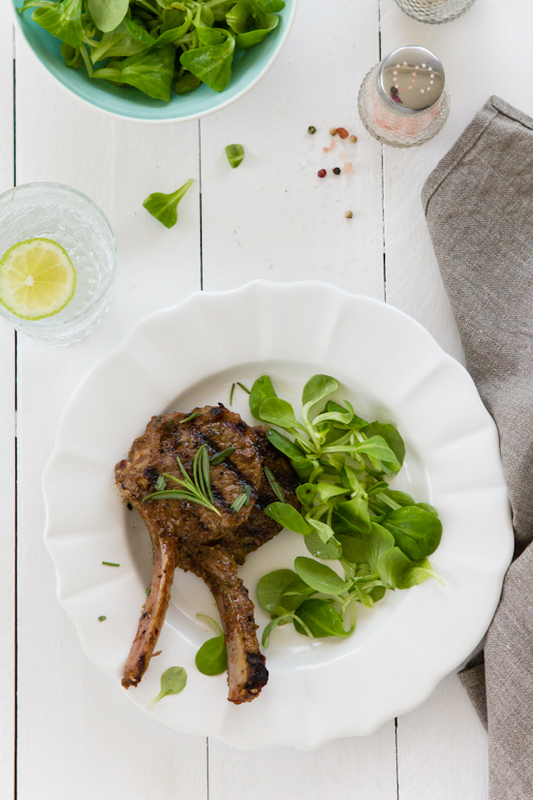 We just got started with some grilling this week and I am sure I will come to this lamb chops recipe for one of the weekend BBQ party. As always gorgeous clicks! I love everything about this post...your story about the job, the delicious lamb chops, and your burning desire when you picked up that point and shoot. Wonderful article. PS. I have a US mailing address. And now I follow @lecrueset, too! And I just 'liked' your FB page. 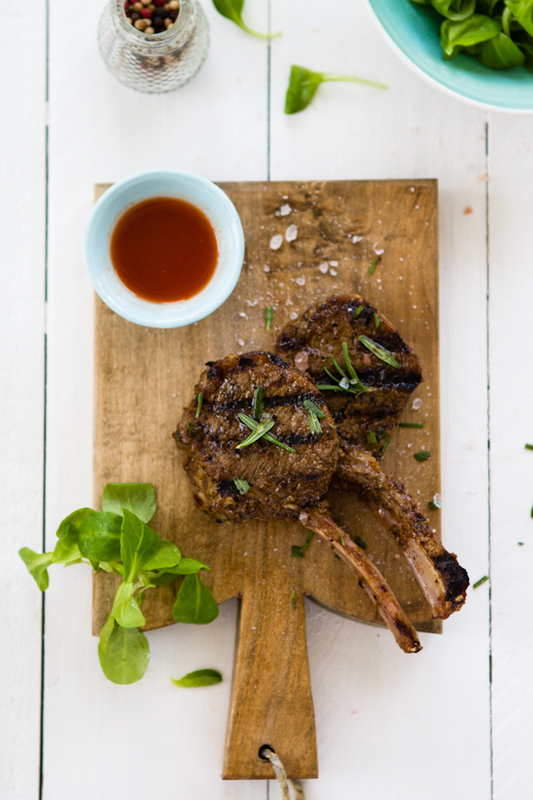 Love to grill a juicy thick rib-eye steak - South African of course! Pineapple on the grill! Yum! Love your blog! Awesome awesome! I love to grill barbecue chicken, since it's my favorite food. Sukaina, I just cannot stop loving your food photos. Looks delicious, you really know how to capture the appealing food. We wish to win the leCreuset skillet, it's very good brand. I love to grill onions and peppers, and pizza! Saladgoddess already following LeCreuset on Twitter. Following Sips and Spoonfuls on FB! My favorite thing to grill is burgers. I followed @lecreuset on twitter. We raise beef and so I would have to say burgers! Gorgeous clicks, Sukaina :) Love your story-telling about photography. i like to grill korean short ribs! Lately my favorite food to grill is a pork tenderloin! We add my mother-in-law's rib rub, then grill/smoke it for a few hours. So good! Email subscribed to your beautiful blog via link at top right. I never grilled with a pan. Would love to try grilling our fav beef bruchettes with this pan. Just discovered you site today, but I don't want to miss anything so I've added your feed to my RSS reader! Also following you on Twitter (@raquelwilson)! And we like you on Facebook (Raquel Wilson-Sow)! i love grilled chicken! Thanks for a super giveaway! My favorite thing to grill is Portabello Cheese Burgers.. sooo yummy.. Wonderful post, great recipe and amazing photos. Thanks so much for sharing and for the chance to win. 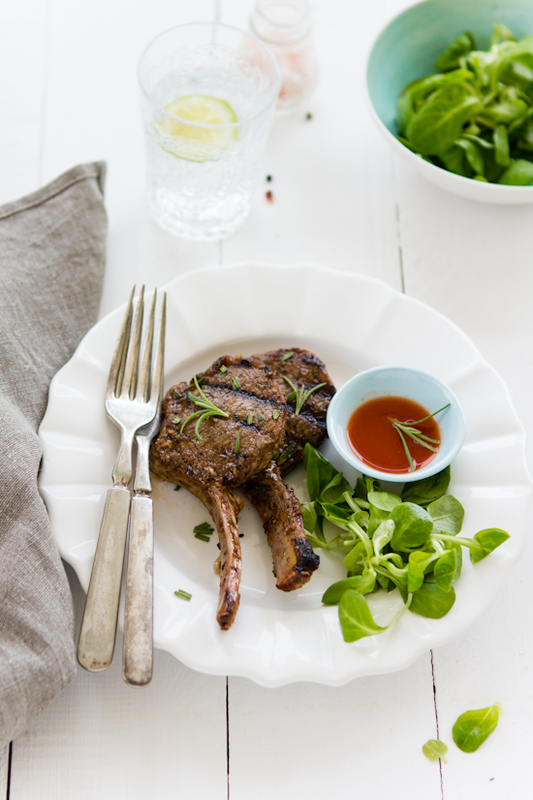 Love your grilled lab chops photos. They are gorgeous. As I'm still learning food photography myself, I have to say your photography and food styling skills really inspires me. Really admire your work. I can totally see your passions through these pictures. For the giveaway entry: My favorite food to grill is Rib Eye Steak! 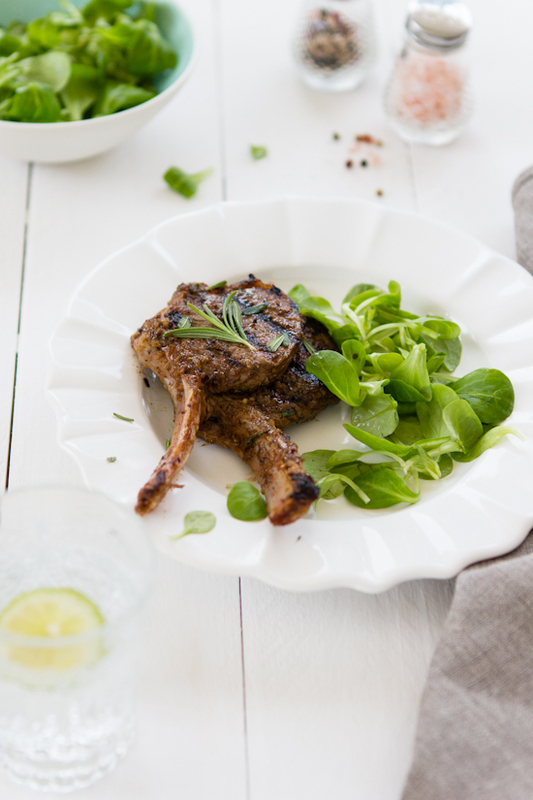 yum...your grill lamb chops might soon be my new favorite, can't wait to try the recipe. I think one of my favorite things to grill is flatbreads. All the great flavor and aroma of fresh bread without heating up my kitchen with a 500 degree oven during the summer. I love to grill chicken and salmon. 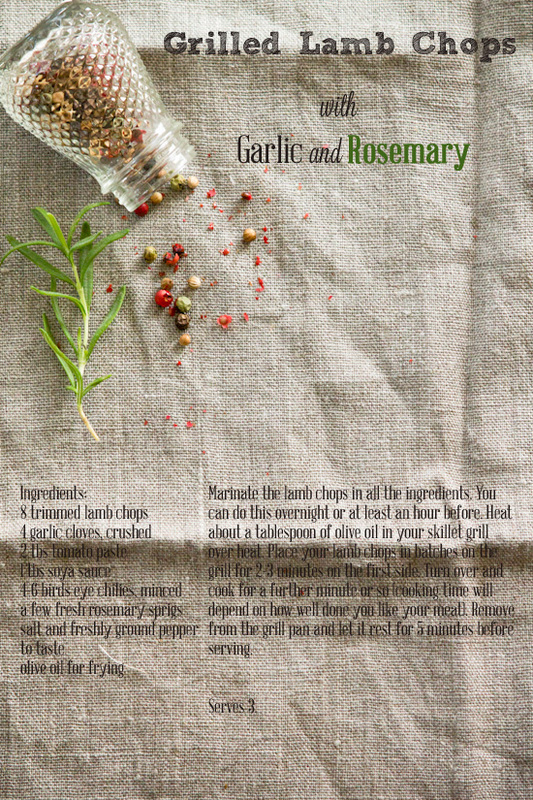 Garlic + rosemary is one of my favorite combinations! I love to grill almost any vegetable! I think grilling really makes everything more flavorful. I'd love to win this grill! I liked Sips and Spoonfuls on Facebook! Mmmm grilled vegie and chicken kebabs!! about it and love studying more on this topic. would have done if I had not come upon such a thing like this. analysis you made to create this actual publish extraordinary. Excellent activity!